Drive south from Auckland, through green farmland, before you arrive at Waitomo – home to one of the finest glowworm caves in the world. Beneath the rolling hills of this region are subterranean wonders that attract visitors from around the world. Here you can enjoy ancient and huge limestone caves decorated with stalactites and stalagmites. The stars of the show (literally) are the thousands of twinkling glowworms suspended from the cave ceiling. 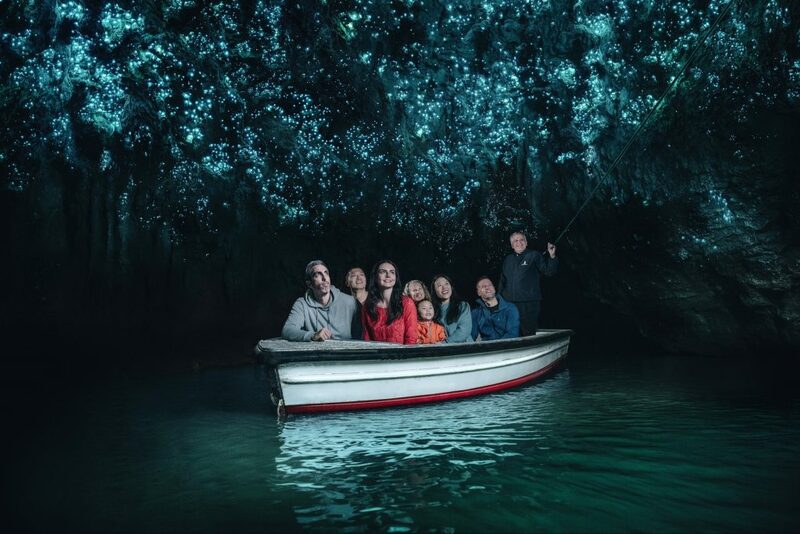 The boat ride through the Glowworm Grotto, under the canopy of twinkling stars, is mesmerising. 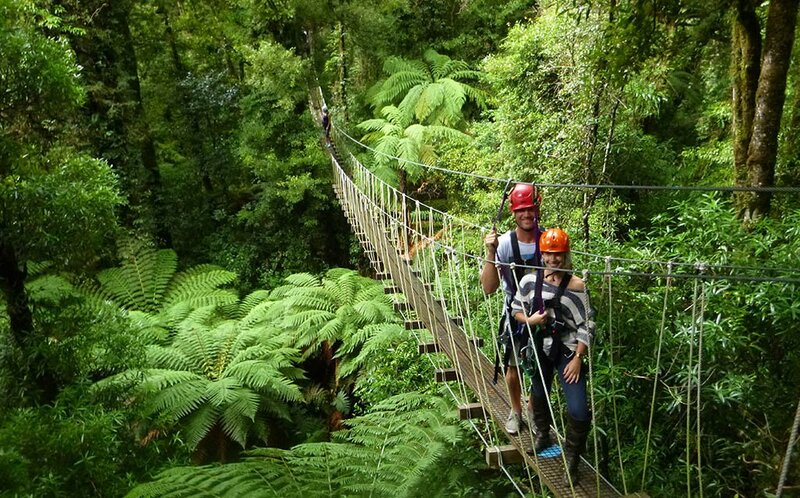 Book your Waitomo Caves and Rotorua Canopy Tours together and you can save 15%! After your caving adventures, continue south for a two hour adventure to Rotorua - a natural wonderland. Rotorua is bursting with volcanic activity. Everywhere you look, you will find evidence of the Earth’s raw power. Begin with a stroll around Kuirau Park in the town centre to see bubbling mud pools and even soak your feet in a thermal spring. Entry to the park is free. If you’re looking for a grander spectacle, head to one of the many thermal parks in the town (paid entry) where you can see bursting geysers and sulphur pools in stunning colours. For lunch, head to Eat Streat in central Rotorua for a variety of all of our favourite food and drinks. The Maori village of Ohinemutu is also a good spot to add to your Rotorua itinerary. In the evening soak in the mineral natural hot waters of Polynesian Spa, right on the edge of the lake. Want to save some $$? Then save $20 if you book the Zip and Soak combo with Rotorua Canopy Tours and Polynesian Spa. Waterfalls, native forests and geothermal wonders - Rotorua is a pretty special place to visit! Your day begins with a three-hour adventure through an ancient forest canopy via a network of zip lines, swing bridges, walking trails and tree top platforms. Certainly a highlight of your Rotorua itinerary! If you’re a little worried about heights or jumping off platforms via zip lines, don’t be. You’ll be in the safe hands of Rotorua Canopy Tours’ expert guides who mix in the thrills and fun with interesting information of all things New Zealand and the conservation efforts that go on here. The tour can be booked in conjunction with the Waitomo Caves adventure, saving you 15% or with Polynesian Spa saving you $20. After this thrilling morning, wind down with a cruise on the lake (plenty of options available and bookable via the i-Site) or another soak in the thermal hot springs. Head to Eat Street again for dinner and try somewhere different, or if you’re in the town on a Thursday night, head to the Rotorua Night Markets. Pick a walk (there are many to choose from!) and continue exploring Rotorua’s natural beauty. Our recommendation would be the 5.5km Blue Lake Track. You’ll walk through native bush with views of the stunning Blue Lake. On a clear day, you can even see the Green Lake from certain points on the trail. For the more adventurous walks, the Rainbow Mountain Track is perfect. The 360-degree views from the top of the mountain are stunning. Another favourite is the 30-minute Hamurana Springs walk with its crystal clear natural fresh water springs. It's the perfect way to end to an amazing Rotorua itinerary! If you want to spend some more time in Rotorua then check out our 5 day Rotorua Itinerary.